If we are what we value, then our values inform what we do. Rachel serves as an independent strategy consultant working with individuals and organizations to assert their creativity, connect on value, and make hard decisions that increase the odds of their success. Simply said, she focuses on strengthening your capabilities for maximum benefit. Assumption busters, confidence assurance and innovation opportunists, Rachel helps you learn and understand which of your efforts others value. Her experiences using facilitation and collaboration for the sake of value creation drives many of the thoughts shared on this blog. Rachel is also available to help you obtain differentiated results and create measurable, meaningful value. When measuring effort, are you supporting competency and excellence? How am I doing? That nagging question arises only in very limited situations where our performance means something personally. Randall Munroe’s XKCD humor aside, when it comes to focus point of view matters. People don’t always consciously choose, or control the quantity of effort and attention they willingly apply to a task. The results consequently vary in quality, elapsed clock-time and obviously cost. If you’ve ever lost time and perspective and found yourself completely absorbed and intently focused on a task, use that as one reference point. Did you work at it? Does measuring your performance on the task matter, or just the results and the experience? Task managers may activate someone to work but few engage the individual’s energy and commitment to quality acheieved by successful game makers and psychologists who study motivation. Dan Pink in his book Drive, explains why differentiating the task is as important as differentiating the incentives. He goes on to explain that hgh performance connects to something other than rewards which proves difficult for organizations who need to harness individual’s efforts in service of its goals. Thankfully it’s 2018, and the opportunities for businesses who spend the time and effort to reorganize and separate the meaningless from the meaningful tasks gain considerable advantage. These organizations harness technology to speed and standardize processes while being mindful of people’s desire to do well. In Manufacturing, Toyota Production Systems and Lean Methods proven adaptability led many industries to embrace this management philosophy, and miss its strategic imperatives that require three to five years in order to produce the lifestyle change that deliver results. It’s not enough to merely measure performance and seek improvement, both must also represent tangible, meaningful values. Feeding the desire of individuals to do well unfortunately competes with a firm’s desire to be efficient and effective. It’s easy to confuse the meaning behind psychologist, and pioneer in organizational development Kurt Lewin’s suggestion. Management workflow designs that narrow the set of tasks, or reduce the steps do minimize errors and promote consistency. Add in “idiot proof” design of automation and interconnected technologies will make tasks more convenient and tools easy to use–the digital tools include just in time support pop-ups. The efficiency gains acheived by eliminating choices and inadvertently spare people’s attention to the task and thus rob people of finding meaning in their effort. Pal’s a fast food company founded in 1956 in northeastern Tennessee does this too but with the employee’s point of view and objectives in mind. Unlike their quick service peers, Pal’s generates $1,800 in sales-per-square foot annually, versus McDonald’s which typically generates less than $650 of annual sales per square foot. These are the figures and full story that William Taylor tells in Simply Brilliant (2016). Taylor describes the Pal’s management choices through the lens of experience. I sense that Pal’s leadership team interpretation of Lewin’s message as harnessing the contagion power of experience. Walt Disney translated the message at another level that focused on the reason we repeat any experience. There’s nothing unusual in that description. Special hiring, training processes, or sharing their approach with other companies sounds just like the other successful high experience focused firms– McDonald’s, Zappos, Disney. The Pal’s difference is their high bar, the “Triple 100—100 percent execution 100 percent of the time, even when restaurants are operating at 100 percent of capacity.” The point of view built into their mindsight focuses on making employees successful, by holding the leaders and managers who trained them accountable. Pal’s teaches and coaches every day because growth isn’t just about market it’s about people and leadership development. They hire and guarantee the success of people who want to learn, and employees stick around. They don’t stick around for the high wages or a pension. They stick around for the shared learning, opportunities for personal growth and the pride in being consistently excellent. Organizations, after all are made up of people. For the near future their success will depend on their ability tap the human need to do well, and offer individuals personal room to grow, continuous support to learn and power to create. Competency depends on circumstance as much as attitude. Ask any high performer and you’ll dscover they still practice and find ways to improve. So why don’t more organizations invest for that level of success? We haven’t met, but each of you express a candor that suggests you are open to informal input. Naturally, I was not alone in my surprise over your companies- JPMorgan Chase, Berkshire Hathaway and Amazon announced plan to enter the healthcare marketplace. The cover story I saw, explained your unified commitment to contain, if not reduce employee healthcare costs, without mentioning any specifics. My first thought was perhaps this was a prelude to a presidential bid. The announcement’s bold leadership play has garnered great public enthusiasm. My second thought recognized the power vacuum that followed the failure of the national government to make change. Your united commitment, and unspoken appeal for other CEOs to join you could create further momentum for market driven change. These thoughts still didn’t feel quite right. I remain optimistic and root loudly for other change agents to shift the tide. As we all know, the challenge to deliver healthy outcomes and affordable healthcare for all are not one dimensional. The complicated systems presently in place fail to address the larger complex inter-relationships between community and individual health. “It’s easy to think of “health” as just another category of social-service spending. But a great deal of modern research suggests that it might be more accurate to think of it as the payoff of all the other services put together. Are you Seizing advantage or opportunity? OK, it’s why I’m asking you to widen your goal. Don’t settle for negotiating a better deal than what present healthcare arrangements are able to wrangle. To Jeff, I wondered why you sought out Jamie and Warren to play in an arena internally Amazon team’s have been working, and compromise your reputation and general industry slaying capacity? Amazon’s platform successfully delivers efficiency and value to end users. Are you suddenly squeamish about squeezing healthcare providers and yes, your employees too? Scott Galloway, the NYU Stern faculty describes in The Four your outsized vision has long exceeded the pure e-commerce play that is Amazon today. Galloway further empathizes your tireless advocacy for technology touched by realism about automation’s impact and downstream effect on wages. These last points makes Jamie a strange bedfellow, as the banking business depends on individuals’ with incomes. But that’s a different letter and article. Jamie, under your leadership JP Morgan Chase offers expertise in compliance, as well as payments and savings that can create some cost saving synergies in Healthcare. More importantly, both industries service and needs are intensely local and subject to state regulations. The consolidations in both banking and healthcare had to rethink bricks and mortar location and staffing. Increasingly, financial services delivery via un-staffed, self-standing kiosks/ATMs and/or rely on mobile enabled applications. Banks, relative to healthcare, historically leveraged technology savvy to fuel growth balance risk and reward effectively and efficiently. Jamie your investments and innovation, though slow starting, and less evenly distributed across the investment, consumer and commercial bank–they do suggest you can leverage the to deliver greater opportunities and create value in Healthcare. Warren, I’m also hoping these are a few of the elements of value you spotted too. Again, several closer observers of your group planning reiterate that limiting your collective primary intention to lowering employee healthcare costs, reduces the life value of the proposal. That shortsighted objective is certainly not likely to deliver the return on investment necessary to make a dent. I’m counting on you Warren, and your experiences creating larger and profitable opportunities from reorganization. 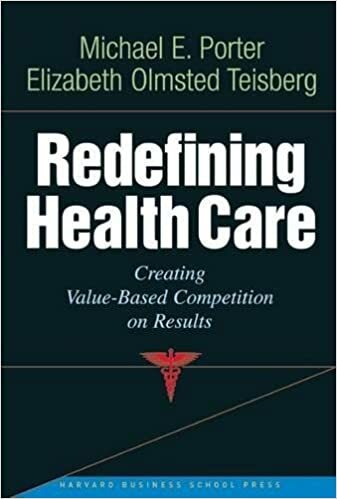 As early as 2006, Michael Porter summarizes the strategic dynamics and cost challenges associated with creating quality healthcare outcomes in Redefining Health Care: Creating Value-Based Competition on Results. The environment he describes of dysfunctional competition leads players to “strive not to create value, but to capture more revenue, shift costs, and restrict services.” Porter felt that healthcare lacked discipline and a management and business focus. Jeff, Jamie and Warren is that your take too? I don’t know if it was conversations at Davos and chats with deeply knowledgeable wranglers of this problem that inspired you to act. I’m inspired by data. As the Affordable Care Act continues to make available additional data, it’s possible to learn more about what works. Since 2006, researchers in both social and medical science enable more models of service and extends understanding of human health at the individual and population level. Much of healthcare activities used population data to allocate resources. Efforts to reduce costs associated with an individual can now take into consideration individuals’ behaviors. Continued use of aggregate process and success measures mask the affects of too many associated care conditions and reactive activities. “Population health puts people into categories by conditions (diabetes, hypertension, depression), age, lab results and medical billing data. These categories presume their own importance. When in fact, psychosocial, behavioral and environmental factors determine individual health far more. Patient goals, preferences and barriers to care tell us what stands between that patient and better health. Without this data, population health efforts are undermined. Is this your collective aspiration too? Why not just partner with Success? A few weeks ago, I attended a presentation at Chicago Booth’s Rustandy Center by the Chief Medical officer for Oak Street Health, Griffin Myers This new medical group does not serve everyone, but the patient population they do serve have consistently better outcomes. The business model that Oak Street Health adopted throws out the traditional fee for service model insurers favor. Instead they get paid when they deliver services that work, the successful outcomes embodied by Accountable Care Organizations as specified in the Affordable Care Act. Oak Street established a value-based care delivery model exclusively serving Medicare (and Medicaid dual-eligible) patients in low income areas. They presently operate 24 clinics across Illinois, Indiana, and Michigan. Another alternative model of care that should inspire the three of you is Oscar Health, whose estimated valuation of $2.7billion, and claims to be the first technology-based insurance company. Mario Schlosser, an immigrant from Germany realized before the birth of his first child an opportunity to put his own special skills as a data scientist to work. His first hand experience navigating the complexity of the healthcare system led him create Oscar Health in 2012. The company “uses data and product design to guide you through your health care and get you healthy.” As of Oct 2017, he has raised over $720 million and delivers over 100,000 patients concierge style team care in New York, New Jersey, San Francisco, Cleveland, Nashville, Austin, San Antonio, LA and Orange County. Note, many of these cities feature innovative health care service providers but boast a volume of technology talent too. This interview with Mario on Techcrunch Disrupt in 2017 is a good overview. Both these approaches recognize that healthcare requires high touch, and a constellation of services to produce the desired outcome. Both of these innovative for profit companies are heavily invested in use of data and technology. So Jeff, Jamie and Warren under your leadership, will you be equally committed to facilitating connections between traditional care givers, services and systems or just cut out the human to human touch? Whatever you do, it will be interesting and I’d be happy to help. The reminder, you can imagine, wasn’t always welcome though it was often needed and useful. It’s easy to find ourselves overdoing something, and that includes overthinking too. Few people relish the experience of others questioning their judgment, or their competency challenged. Oddly, very successful people do. Bby soliciting helpful input frequently, they gain new perspectives and often advantage. Their success reflects efficiency and effectiveness made possible from others’ perceptions, understanding and experience in precision and quality . Ever find yourself picking up the wrong impression,mis-understanding directions, or losing valuable time and energy believing you discovered a shortcut others missed for good reasons? Worse, ever find yourself having to redo something because the task was poorly defined, or inappropriate for the situation? It’s simple to turn a reactive approach into a proactive plan. Taking a moment to repeat what you heard, request and then follow up with a statement of the steps you intend to take often spares everyone disappointment. Replace the knee jerk why questions in your head with clear, positively stated responses both convey what you understand and assure the requester satisfaction of their needs. It’s simple, and yet the extra moments to pause, don’t trigger an active assumption check. In thinking through what’s next we too often skip over the evidence or clarify our own understanding. Successful people ask questions with confidence because they value their time, and also believe others do too! Time is money, are you using real time data wisely? Are you feeling up to date, in sync with the times? Both individuals and organizations find it challenging to fully leverage technology and integrate the sea of real time data that surrounds us. This past week, I attended a local Internet of Things (IOT) conference, only to be reminded how we’ve been kidding ourselves with respect to the human machine dynamic. When Factiva reported in 2013, that the previous two years had created 90% of the world’s data, it also reflected the impact of visibly faster technology and emergent opportunities for those capable of wrangling more data. Similarly, the exchange of information machine to machine and the responses that IOT and the Industrial IOT (IIOT) make possible will soon surpass all human generated information. Information has never proven more valuable to competitive advantage than now. The key istimely mastery and/or the ability to separate meaningful data from noise. Possessing Real time capabilities merely up the ante. Suddenly, all of the conversations about the real, meaningful difference of Big Data clicked. The challenges I knew and had experienced working with volumes of data is not something everyone experiences, and itswhy I missed the significance of the message. Language can do thar. Today’s – competitive advantage relies on learning synchronicity between people, and also between people and machine. Yep, syncing as in coincident timing. Timing reactions require coordination on the order of the elaborate dance numbers Busby Berkley made famous will separate winners and losers. People are interesting precisely because we begave inconsistently. These same traits make us effective competitors and efficient information processors. We focus and only selectively pay attention, which means we consciously ignore most information in our midst. Unlike machines, we are slow few of us possess capabilities to process high volumes of complex data at high speeds. How people integrate data remains a bit mysterious. Part conscious and part unconscious, each of our senses connect to different parts of our brain and the information isn’t always processes with consistency. Humans create their own reality. For example, our eyes see things differently than what we describe and not because of language problems. Automatic transformations correct using depth perception and pre existing knowledge to flip the image, while sound tends to retain its integrity. Similarly, information new to us versus updates also process differently; and yet, endless streaming information can overload and confuse us. Today’s powerful computers don’t experience anxiety or fatigue though they may overheat or fail. The natural limits of time and energy challenge people to choose their focal point, the when and how we respond to data and perceive opportunities. For example, few of our waking moments and activities require conscious thought. Our body takes care of itself and manages to coordinate processing of external sensory information with internal demands. This syncing makes possible mindless activities like breathing, eating, walking and resting. Consciously, our ability to track our time and energy is spotty. Still, unstructured/unplanned moments, especially those that demand little of us mentally remain ideal, while society frowns on the same characteristics when referred to as idleness. The contradiction reflects the value we attach to purpose or meaningful use of effort over time that results in tangible output. Artists create, builders build, analysts compute and chefs cook for example by adding their effort over time. They make something or transform original materials/inputs. The notion of efficiency also boosts the value of effort by measuring the effort relative to the output produced over time. Likewise effectiveness, measures the additional value produced relative to the starting inputs. Together, these measures translate into meaningful consistent tokens of value that permit ready exchange, or wealth accumulation. In this context, the accumulated tokens of value allow us to buy ourselves time to take vacation or be idle as easily as buy us time to learn, create and do more. This also explains precisely why technology advances prove so valuable, as they have progressively reduced the amount of time and effort necessary to perform a task. As a result, we DO spend less time on common, routine activities than was previously necessary. Internal plumbing saves us time we spent fetching water, Wheeled transportation saves us time we spent walking, and similar telecommunications vastly removes the break in communications that once necessitated considerable effort to cross the distance by one if not both parties, or the enlistment of a proxy to carry the message on their behalf. The human messengers were replaced first and written notes/letters, and then the telegraph dramatically reduced the time between message sending and receipt. Now text messaging and email is displacing telephone and video conferences. This evolution in communication methods affects the people’s interaction styles but also their information needs and expectations. Real time communications savings and benefits are not equally distributed and so inefficiencies persist. On one hand they present a new opportunity to replace planning and documentation of activities essential when communications were primarily indirect and time lagged. Built-in tracking, boosted transmission capabilities and data recording can both fill in and increase information gaps. Problems associated with incomplete, unsupported or even delayed information that always created risk persists, but for new reasons. The flood of data from more sources both people and machine generated pose new challenges to separate out meaning, predict and or respond in timely, relevant manner. Another opportunity real time capabilities offer are all around us, assisted by the information collected and transmitted from multiple data sensors scattered across the environment. In fact, it’s how airplanes fly automatically, rail road cars notify switches of their location to either open or close crossing gates, motion sensors in buildings adjust level of lighting and air temperatures, and Tsunami warning systems saves lives. In general, people are wired to process information in real time. We use an array of body language cues to understand how to manage the situation and engage with the people in our midst, and yet we do it unconsciously. Planning on paper is a far more conscious activity, time consuming and energy draining. Worse, planning often stops us from activating the unconscious real time processing. We follow the plan, rather than notice the inconsistency or the more obvious information we may or may not have incorporated. Best example, is the step by step navigation systems that we know are less than perfect. Have you found yourself using the navigation only to discover it’s asking you to turn onto a one way street going the wrong way? Or your location is “ahead” of the GPS signal and so you miss a turn? My point is this. Too many built in business procedures and processes were designed in the absence of real time information. In order to be more relevant, more valuable people will need to revisit their processes with respect to learning, creating and doing. It will require a shift in attitude, refocus of needs and adjustment in expectations. It’s a shift from a look back and partner with machines that look forward, use more data sources and get to analysis faster. If you have any examples of success or any challenges I’d love to hear about them. Paolo dal Pozzo Toscanelli, Florentine astronomer 1474 projection of the Atlantic Ocean geography (shown superimposed on a modern map), which directly influenced Columbus’s plans. I’m happy it’s Columbus Day, not because I’m a believer in the myths surrounding Columbus, rather because the results he achieved remain impressive on a global scale. If you take the perspective of 1st mover, as in 1st to arrive you miss the point. Likewise, unlike discoverers who know what they have discovered, Columbus up until his death argued with navigators over the identity of the lands he found. Columbus is a story of failure due to incomplete as well as misinterpreted information, dissipated urgency that only political prudence and luck turned around. Columbus’ “successful” 1492 voyage, opened the door to Europe’s active exploration to the west, but not for the reasons Columbus claimed. He failed in his prime objective- securing a shortcut to the Far East. Luckily, the Americas were rich in other resources, which other explorers with political allegiances to countries other than Spain soon claimed. In 1497, flying England’ flag, Newfoundland was “discovered”. This paved the way for England’s extensive colonization of North America, while Spain continued explorations and claims to Central and South America. Yes, history is rewritten by the victors and the district of Columbia bears the mark of anti English sentiment and , part of his myth……..
Everyone experiences failure in one way or another. Recently, I read a wonderful blog post why projects fail by Tom Toohey and Mike Kellim of Envision-Business Consulting. They go beyond the general takes by the business community, to describe why it’s difficult to face up to project failure. The post lays out the general variations, quotes a Harvard Business Review study, Gallup data and then does something wonderful. It makes clear why projects are difficult. This isn’t a simple lesson in dealing with uncertainty, the authors leverage the reality of elapsing time and situations between when initiating project decisions are made and completing the work necessary to move the project forward. In the days of Columbus, geographic distances were impossible to traverse quickly and safely, whether it was news or goods. Everyone suffered the same constraints and information varied in quality and authority. To be a mariner or a trader uncertainty was perhaps attributed to natural law—if you remember your history, these events predate Copernicus and Kepler, and centuries before Darwin upsets the notion of natural order. Columbus and his self guided studies left his knowledge unchecked and the urgency to find an alternative safe, and speedy sea passage to the Far East fueled his overconfidence. Project management works the same way with many estimations left unchecked, and unchallenged in spite of considerably greater access to information and in a more timely manner. So what does Toohey and Kellim say and recommend organizations do to avert inevitable failures? They don’t just advocate for better Leadership, or better Project Management methodology or reduce excuses to my personal favorite, the unforeseen circumstances. Their experiences recognize these are merely substitutes for poor communications. They suggest a closer inspection will turn up another common cause—one or more gaps between what people know and their skills/experiences doing that same thing. Just like Columbus, competency appears to be grossly underrepresented, while confidence remains greatly overstated. Depending on whether organizations make use of post or pre-mortem analysis of the project, several support mechanisms will increase the chance of project’s success. Face it, circumstances and situations don’t always remain in sync with what you know, or your experience making uncertainty about the future ever present and luck will always be a factor in meeting future expectations. The question is what else are you relying upon to make your investment generate value? If you want to learn more about Columbus, Wikipedia is pretty good. I also recommend that you retell his story to your team and find parallels to test your own assumptions, of course, I’m happy to facilitate. Either way let me know what you learned, or better yet changed to improve your odds of success. This morning the fresh thoughts in my head needed to get out. Rather than pick up my phone where plant where automated notifications lay in wait, I found myself the reliable pen and empty pad. Why reliable? Because my hand scribbles could keep up with my thoughts, and nothing interrupted the flow of idea from head to its external representation. Don’t get me wrong, I like and I use technology and find it are in credibly effective. I also am aware that both its utility and benefits remain on evenly distributed. It’s because the intention of makers have yet to work out the options that please permit users and receivers to choose and prioritize their needs. For example when I want to write, I have a choice of software. Each application has it’s merits and there are some standard features among them. Each application however remains subordinate to an operating system of the device. Each application has to specify rules of its use. Yes these include the terms of service but they also include a default that integrates with other software and plays well on different hardware. These defaults preserve the integrity of the users work, make it safe from unauthorized editors or readers, and store the bits as they appear. Some of these settings can be dictated and controlled by the user and some not. Makers of software have learned to pay attention to how their creation gets used. In addition to the functionality they make digitally possible, great care is given to optimize the users experience. The less steps between a users intentional use and actual engagement, the better. The hardware and its operating system improves its value to end users with every new feature and application. Software vendors who play well with multiple applications may improve user experience and vice versa. my problem is the operating system that allows other applications to distilupt my experience. This is especially painful when I’m focusing and the last thing I need is an interruption. For example in writing this post, not only did I get a notification about a news event, but a text from a friend and a bill payment interrupted me and so did my calendar. When I write on paper that doesn’t happen. The ambient environment can influence and distract if I let it however it doesn’t pop up in the center of my attention. We’re still making lots of trade-offs when it comes to working smarter. When I use technology, wider distribution becomes effortless, but it cost me attention and focus. Not every request for my attention deserves immediacy. And simple on or off options don’t help. I definitely don’t open my settings to turn off notifications before starting a focused task and when I don’t it’s as if I’m working in Grand central station where any and every interruption as possible. So no I’m not fully using technology as well as I could. I’m still using old-fashioned tools non-digital devices when I need to focus. what solutions have you found work to keep you focused when you need? How can you stop short term choices from crippling long-term value? As more bad news about Wells Fargo’s practices emerge, the stain transcends CEO Stumpf’s reputation. Warren Buffett opted to wait and comment knowing that he himself needs time to sort through his own internal review process. It’s not just Stumpf who needs to believe that the “cancer “found in the retail bank was its source. The Gr8 prorgram setting very high bars for growth with 8 interconnected accounts per customer delivered results but discovery of the ill effects proceeded much slower. It took years and then the decision to remove the malignancy—firing of low level employees and managers—what made management believe this toxic behavior didn’t spread? Well that’s naïve, if not ridiculous, isn’t it? Elizabeth Warren made clear that an organization must remain accountable to its customers more than its shareholders, no matter how large or successful it becomes. Somewhere along the line Wells Fargo, Samsung, Chipotle, VW, and GM all made similar high profile mistakes. Speed to market may appear an appropriate competitive response but not if short-cutting quality results in shortchanging business value. Bottom line the antenna in a business can’t be only tuned in for reward especially since it often means the business misses the risk signals. The obsession for rapid growth isn’t just blinding good judgment shows in ignorance of the environment and its complexity. Interconnected digital networks absolutely create a speed advantage. But speed needs to be managed, and adjustments made to acknowledge the additional risk it creates. Ask the NASCAR drivers what precautions they take that are absent in other environments, or the Samsung engineers who knew they hadn’t done enough testing to properly advise the risk management team with information that prepared them for the inevitable fire. The Internet made it easier than ever for consumers to find anything, anywhere, and at anytime. Businesses and sales people need to adjust and adapt to accommodate these more informed buyers. At the same time management goals or quotas must recognize changes in the environment, but looking more broadly at the inevitable interactions and the change in likelihood that they will occur. It may be a cliché, but it isn’t true that what got you here will get you farther. What worked in the past works differently today and will work in another way in the future. The trick is to find the part that is essential and remains critical. Water does seep to the lowest level, but technology advances have created stronger more resilient and resistant containment mechanisms that alter the impact. Don’t wait to understand them until it’s too late. Start by answering these questions to the satisfaction of your leadership team and board. How does your management team leveraging or limiting the new levers of change? How does social media, sensor networks, big data and cloud computing alter the behavior of your customers? What risks to your bottom line do they introduce? What steps have you taken to mitigate and or adjust your targets to assimilate them? Though we experience life using multiple senses-sound, taste, touch,scent and sight, how much do we actually use to understand our place and actions? Consider this two dimensional picture, the visual more than likely drives the meaning we make. Did the words add any more meaning to what you understood in looking at the picture? Last Friday, the strategy discussion I lead monthly talked about visual thinking and I realized how readily my business training reduces most if not all of the perceptions available through my five senses down to only one or two. At work, we use words or numbers and rarely put both together as well as this tweet and accompanying image. This visual asks you to interpret the worn out paint or coating and recognize a normal distribution , which is a statistical explanation that adds another dimension to our understanding. Could you plot a graph with the information you ob serve? How about wear vs. weight? That’s only two dimensions, with weight values on the x or horizontal access, and wear shown on the Y or vertical access. It might look like the two dimensional graph on the right. Does this representation tell you anything more than the original image? I assigned numeric values to the different amount of chipped coating. Do you connect the current location of the weight on the machine as 170 across and estimate as I did 20 up? Both image and graph show, but don’t tell as much as we assume. Where’s the context? Do you know the amount of time it took for the paint to chip or relative distance between observations, or usage of the machine itself? 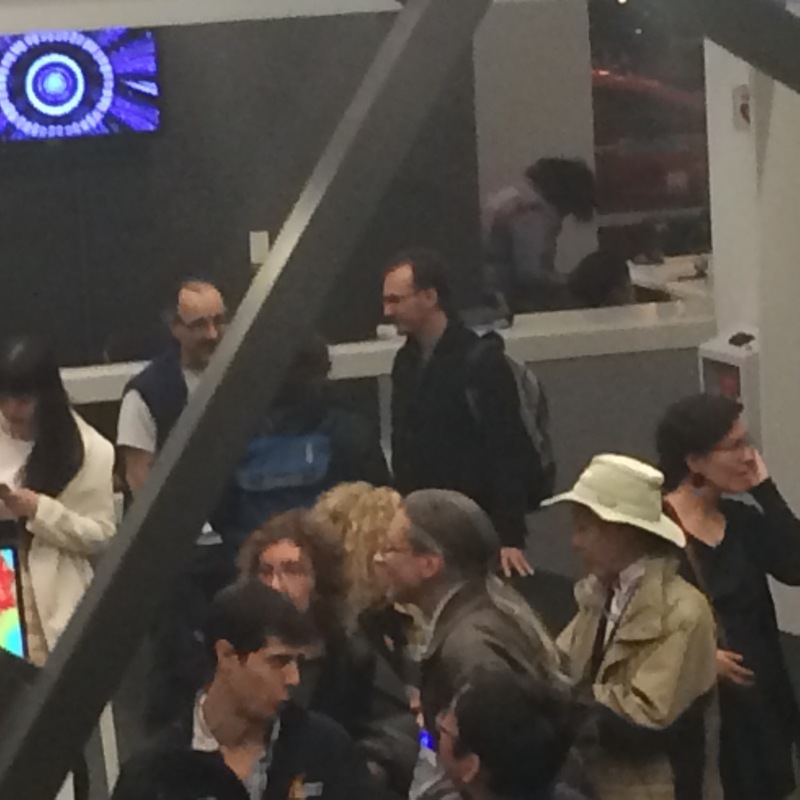 We know nothing about the users of the machine, or its location and yet we do don’t we? The rust itself takes time to form and we can infer that more users choose at least 50 pounds, and the most users 90 pounds. Next time you view a two dimensional graph–ask yourself what’s missing? Try to voice and articulate the context that you’ve assumed. Yes even if you do it alone, as hearing your thoughts activates different processing. When you do it in the company of others you will be surprised at the differences in your understanding. I happened to see that DataScope analytics, a Chicago Based Data science firm had posted a request under data science on Reddit. They asked “What data skills do you wish non-data people you worked with (e.g. managers, PMs, marketing, HR, etc.) have? The responses on Reddit were quite fascinating. Personally, I couldn’t help but notice how the replies typified the constant challenge and struggle that any information or data presents to everyone. What does the data mean, what is it’s significance? The same themes arose in the conversation among business people exploring the challenges of visualizing data, in which we quicly recognized that few people see the appearance of data and instinctively look to explore it, versus others whose interest in data are for the sole purposes of confirming what they know. The questions and process with which anyone approaches data obviously informs how it gets used and thus represented too. Too often we use only one or two dimensions as suggested by the graph of the interpretation of the photograph. I created the variable wear based on my interpretation of frequency approximated by the degree of chipped paint. In contrast, the two dimensions suggest more than they reveal about how the world works. Economists, for example, plot supply and demand curves that look like a large X. Supply being the first line that descends vertically, and demand the second line that Ascends. The vertical access is Price and the horizontal access quantity. What else is assumed in this representation? Geography? Time? what about probability and or frequency? Accuracy or specific observations as in the photograph are not the point of the representation. It’s merely to create a general understanding of the relationship between price and quantity from two different perspectives. The economists are exploring and not predicting behavior, they are merely seeking ot make sense of the world not necessarily profit from it. Further explorations that southt to clarify the assumptions led to the evolution of the behavioral economists and their additional perspective enahances general understanding of people’s beyond the one dimensional buyer or seller role and expanded the representation. The inclusion of additional dimensions of probability also introduce additional complexity in exchange for greater understanding. My own training as an analyst has led me to begin with exploration, and interrogate rather than merely to extend or convert the representations. There’s always ore than meets the eye when it comes to understanding what we see.